Before I begin with today’s topic I would like to point out that I am to art and video editing what Jedward are to music. During the past 2 weeks I have found myself delving into screencasting and video editing. I recently wrote a review for Point Linux 2.2 and whilst writing the review I decided to do something that I had never done before and create a video review of Point Linux. My plan for this week was to install and review SparkyLinux but due to other commitments I have not had the time to complete the review. My daughter and her friend had a joint birthday party yesterday in the local village hall and the equipment in the village hall is pretty good including audio equipment and a video projector. For the party, we created a playlist of music from my son’s Samsung Galaxy S3 to play through the sound system and we had a few disco lights as well. To make things more interesting for the kids I was asked to create a video loop to play on the projector which would loop through whilst the music was playing. tools I used to create the video loop for the projector. I wanted to use the Dell Inspiron 15 laptop for the video loop because it is currently dual booting Windows 8 and Ubuntu and I wanted to be sure that if I couldn’t get the video to work on Ubuntu (I was short of time and didn’t have much time to play) then I would have Windows 8 as a backup. I don’t think the Ubuntu Software Centre is fit for purpose. Whilst searching for screen casting software the “Ubuntu Software Centre” returned 1 response. 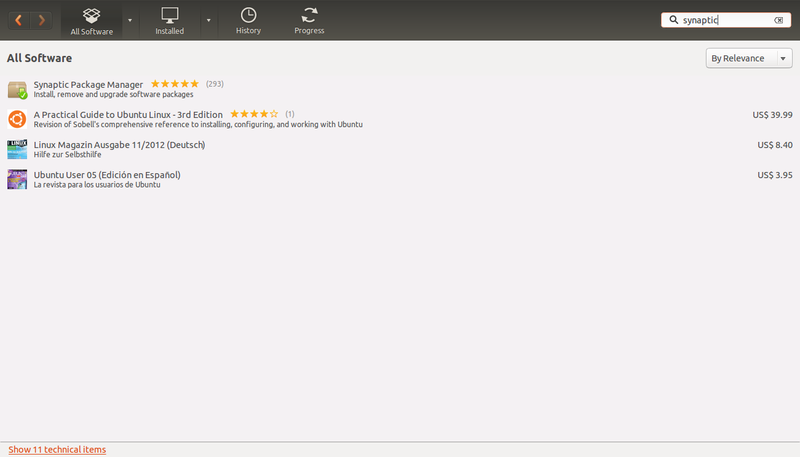 Whilst searching for video editing software Ubuntu returned the above results. I know that the repositories have a lot more available than the results returned by the Software Centre and it appears to me that the Software Centre is more interested in trying to sell stuff than it is to returning quality results. This brings me to the first piece of software that you should install. 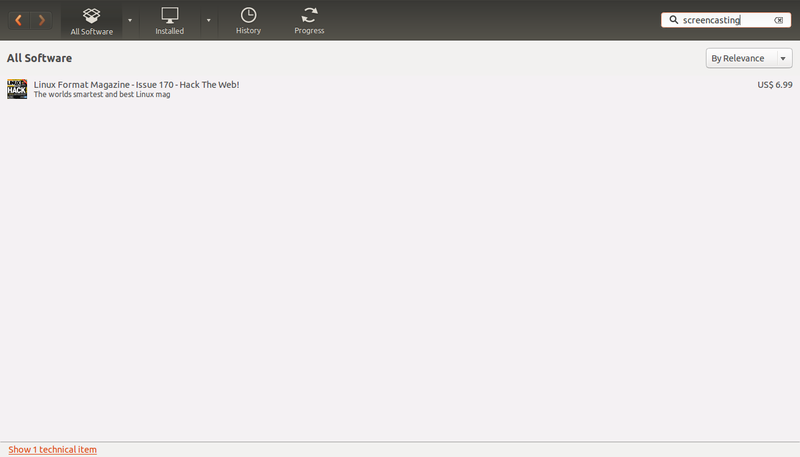 Fortunately the Ubuntu Software Centre does have Synaptic available when you search for it. Install Synaptic and then run it by pressing pulling up the dash and searching for Synaptic. To make sure the repositories are up to date click the “Reload” button. When you search for “screencast” in Synaptic a much better set of results is returned. I would always recommend Synaptic over the Ubuntu Software Centre. It may not have the glitz but it is fully functional and returns everything and that is key. 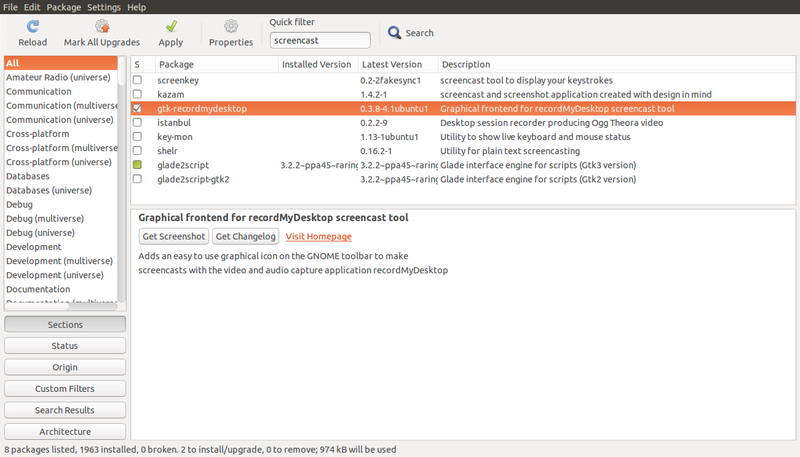 Within Synaptic search for “screencast” and then mark the item called “gtk-recordmydesktop”. To run “RecordMyDesktop” open the dash and type “recordmydesktop”. The “RecordMyDesktop” application records all your keystrokes and movements. This tool is very good for creating instructional videos and also for recording a review of a piece of software or indeed an entire operating system. To get started press the “Select Window” button. This can be the window of an individual application or you can press the entire desktop. Pressing “Record” starts the recording process. You will notice in the system tray a small red dot when “RecordMyDesktop” starts. This changes to a small red square when recording is in progress. Do whatever you need to do for the purpose of recording and then press the square and select stop to end the recording process. The “Save As” button enables you to save the recording. The default video format is “OGV” which is an open video format. You can adjust the quality of the video and the sound prior to recording by adjusting the sliders. You will also notice a button called “Advanced” which lets you set the directory where the temporary video file is stored before saving, the frames per second and various other settings. Whilst recording the “Point Linux” review I used a HP headset as this provided a better quality than using the built in microphone as it eliminated background noise. (And in a house with 3 children, a dog and five cats there is a lot of background noise). To edit the “Point Linux” video and for creating a video loop for the children’s party I needed an easy to use video editing suite. The Ubuntu Software Centre came up with a program called “LIVES” and I tried this for about 30 minutes before I realised that it was too cumbersome for my needs. 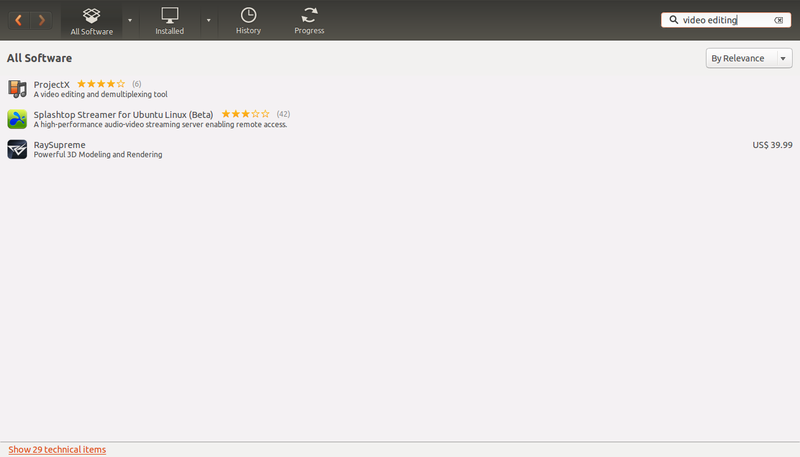 “LIVES” took absolutely ages to load in a short video (“The 60 second Point Linux” review). I also found it really hard to actually get stuff done. I therefore used Synaptic and found “Openshot”. Openshot is very easy to use even for somebody who is artistically challenged. For the “Point Linux” review all I wanted to do was take the video created using “RecordMyDesktop” and add a title at the beginning and a credits section at the end. All I had to do in Openshot to achieve this was to import the video and then drag it down to the timeline. You can add either an animated title or a static title. Whichever option you choose requires another piece of software to be installed. 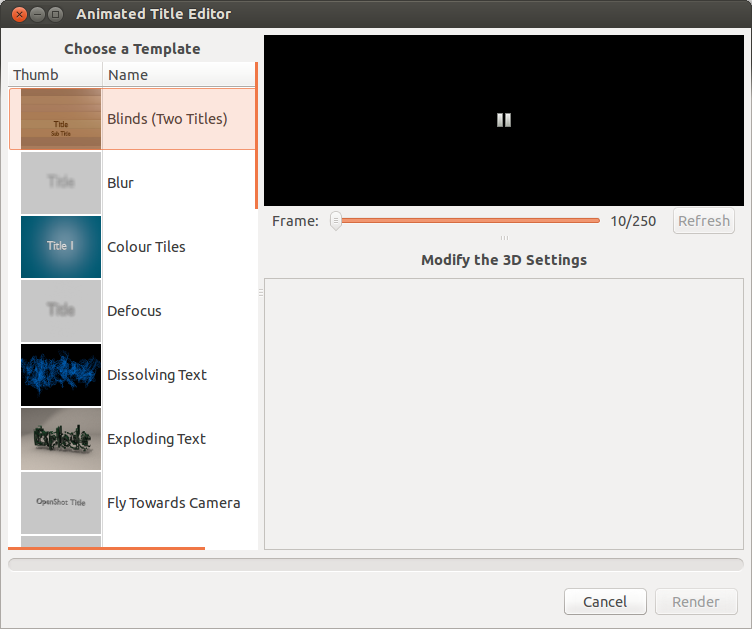 To create still title frames you have to install “ImageMagick” and to create animated titles you need to install “Blender”. There are a whole host of static themes to choose from. Simply select the theme you wish to use and press “Create Title”. This bring up another window where you actually have to enter the titles you wish to use. The preview pane shows you how the titles will appear when applied. The “Use Advanced Editor” option actually opens “ImageMagick”. 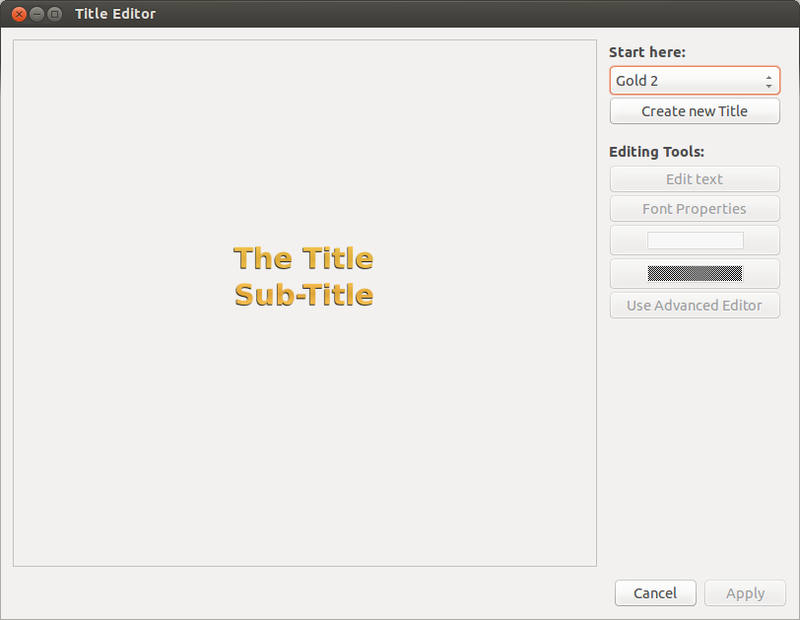 The “Animated Title Editor” also comes with a number of themes. To get a preview of each theme simply select it from the list. A new dialog will appear where you can enter the text that you wish to be displayed. Note that you will need “Blender” to be installed before you can use this function. After creating the title you can add it to the final video by dragging it down to the timeline. For creating the montage of videos for the video loop I imported 4 different video clips (which I downloaded from Youtube). I then dragged the videos down to the timeline so that they were set to play consecutively. The only other thing that I needed to do was remove the credits before and after each video clip so that there was only video and no credits. To do this I played the video and when the credits displayed I pressed the pause button. I then clicked the cut icon (pair of scissors) and clicked on the timeline. This cuts the video in to 2 segments. I then right clicked on the section which had the credits and removed it from the final video. To join each of the videos together I added a few transitions. 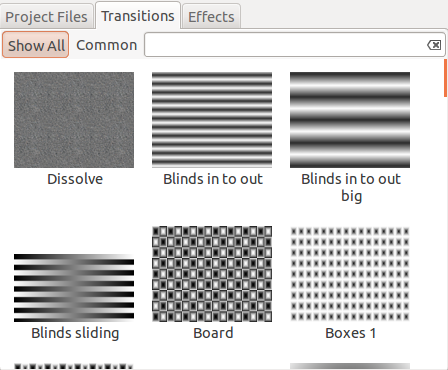 You can add transitions by clicking on the “Transitions” tab. 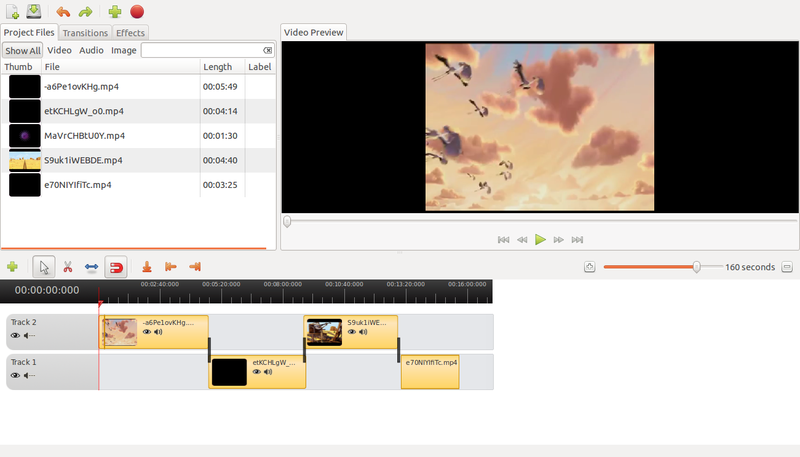 To add the transition you wish to use all you have to do is drag it down to the video timeline. There are also various effects that you can add to the video. To do this click the “Effects” tab and drag the effect to each section of the video you wish to apply the effect to. When you have finished editing the video you can save the project so that you can edit it again later on. To create a final clip though you select “File” and then “Export Video”. Give the file a name and then choose where you want the video to be stored. 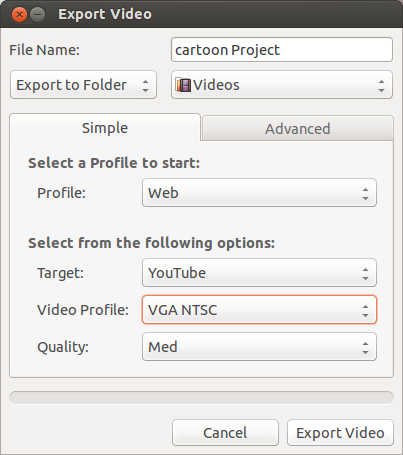 There are various profiles available for storing the video. Storing to the web makes the final video outputs smaller in size. As you can see by the screenshot to the right you can choose the target such as Youtube or Flickr. Other profiles include “Blueray”, “DVD” and “Device”. The export process doesn’t take very long and you can choose to save in a number of different formats such as AVI, MPEG2 etc. For the creation of the video loops I needed videos that were child friendly which could run during the disco. I knew that I wouldn’t need many videos as the kids would dip in and out of watching the movie in between dancing, playing games and eating party food. I searched Youtube and found a number of short videos from the PIXAR movies. To download video I used Synaptic to install “Youtube-dl”. “Youtube-dl” is a command line tool and so to run it you have to open a terminal. To find the path to the video press the share button underneath the video in Youtube. A link URL will be displayed. Copy and paste this URL into the terminal window and the file will be downloaded. Now I have to admit that on the day of the party itself I had some issues. The most notable issue was that Ubuntu wouldn’t recognise the presence of the projector for audio output. The video ran fine but the music which was loaded into Rhythmbox only played through the laptop speakers and not the audio system within the hall. I therefore turned to the darkside and booted into Windows 8. This time I was able to play the audio through the speakers but the Videos application in Windows 8 refused to recognise a number of different formats (I tried various options within Openshot). In the end everything worked out however as I was able to play the audio through Windows Media Player and the video through PowerDVD. Windows Media Player refused to recognise the videos and the XBOX Videos function said I would need to download different codecs in order to play the video files. I would like to have spent time getting Ubuntu to play the audio properly through the hall’s speakers but I would have had 30+ bored kids running riot. I also didn’t have an internet connection to troubleshoot or download any necessary drivers that may or may not have been required. This article has been somewhat of a personal tale about my past week but hopefully some of you will have picked up on some applications that you have never used before. 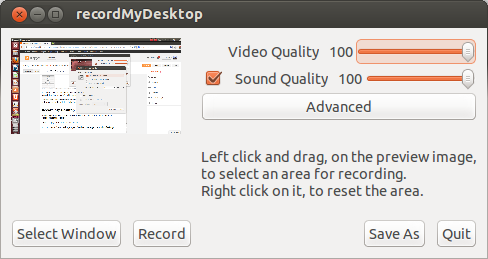 “RecordMyDesktop” is great for recording screencasts. If you want to create a tutorial then it is definitely recommended. Just get yourself a good quality headset. “Youtube-dl” is great for downloading Youtube videos. Now you might want to use it for a different purpose to me such as downloading for when you don’t have a decent internet connection. “Openshot” is great for editing videos especially if you are using it for basic video editing and you aren’t trying to emulate Spielberg or Lucas. Nice, I also use GTKRecordMyDesktop and youtube-dl (in terminal) to do my stuff. Openshot is OK, but it crashed on my laptop…. Hi. Thanks for this post. I'm also a screencaster and Ubuntu user and have written about some of my experiences at the Field Notes of an Audacious Amateur blog. I used happily to use recordmydesktop (CLI version) and am still disappointed that it suddenly and inexplicably started having sync issues (audio would be noticably out of sync with video). I take it, by your mention of a headset, that you did use audio in your video clip but did not have any sync issues–correct? I tried quite a lot of tweaks and workarounds to resolve my issues but in the end reluctantly gave up on recordmydesktop and began using an ffmpeg kludge for making my screencasts. I would love to go back to using recordmydesktop, but until the sync problem gets addressed, I can't. So, did you not have any video/audio sync problems with your clip? I never had any noticeable audio sync issues but my video was quite a quick 60 second video so that voiceove didn't really have to match the keystrokes and mouseclicks that I was making. Probably worth just giving it another try. I've tried posting a comment to thisd blog entry twice, and both times, though the comment appeared initially, it seems later to have been removed. I posted an important question in that comment and was hoping I might get an answer here. So, is my comment being disallowed? If so, why? I am not sure why but both of your messages got caught up in the Google spam filter. As you can see I have re-added your message. sorry about that. Kazam works excellently for screen recording as well. I recorded a 2560×1440 desktop playing TF2 with only a minor framerate drop, and the audio (mixed with a mic) was perfectly in sync. 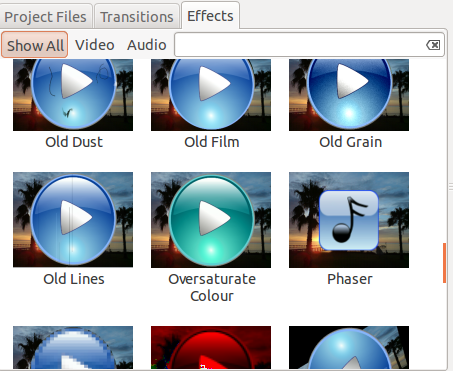 But for video editing, I found Kdenlive more useful. Music is well said to be the speech of angels. Once you start feeling the beauty of it, you are the music while the music lasts. I have developed a hobby of video making after getting retired from the official responsibilities, so I know how can the professional video editing service can help refining my videos and make them more presentable.